First race 1953 Pebble Beach MG TD, ran at Bonneville with Merle Brennan in 1953 and 1954, raced 1927 Bentley 3 litre and 1923 Sunbeam Talbot 4.5 litre and 1928 Mercedes 38/250 SSK in Argentina during the 1960’s. Raced various cars in Mexico during the 1970’s. 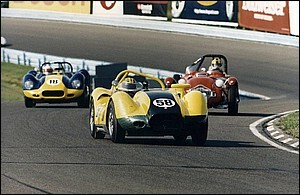 Returned to US in 1976 an started racing an Allard J2X in 1979.Am member #59 of SVRA. Teamed up with Syd Silverman in the early 1980’s and raced Allard JR, Lister Jaguar, Lister Chevy Jaguar SS100, Ferrari TDF and others. In all have raced at all major US tracks, Daytona, Sebring, Homestead, Road America, Road Atlanta, Mid-Ohio, Summit Point, Moroso, Savannah, Coronado, Infinion, Laguna Seca, Portlant , Pacific raceway and Hallett. and MT Tremblant over the past30+ years have participated in over 600 races. Presently race the first Genie Mark VIII built be Joe Huffaker in 1963.